Now that I’m almost 16 weeks along, the nursery does cross my mind every now and then. Okay, okay – it’s on my mind all the time. Today, I thought I’d share some nursery classics that have stood the test of time and remained mine and everyone else’s favorites, even though most of the babies these nurseries were made for are no longer babies. 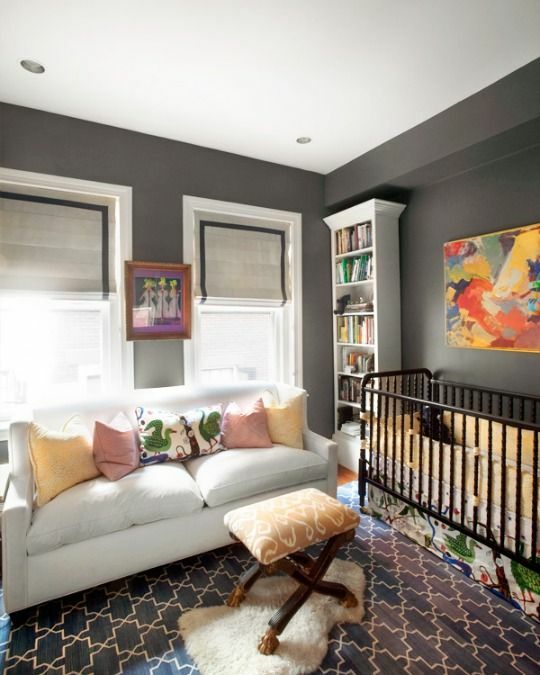 These nurseries are kind of like the “Domino” of nurseries – no matter how many years later, the rooms still feel relevant. A part of what makes this room are the fabulous vintage pieces that she collected such as the lamps and the ceiling fixture. I also love the custom bedding and the stripe on the leading edge tape of the drapes. I don’t know the back story here if the Elements of Style reader was a designer or one talented momma but I’m loving the mix of prints, colors and textures and that big comfy white sofa. One of my classic favorite nurseries came straight out of the pages of Domino Mag all those years ago. I’ll never tire of that petite striped chair, the butterfly roman and the bold pink rug. Mix it up! 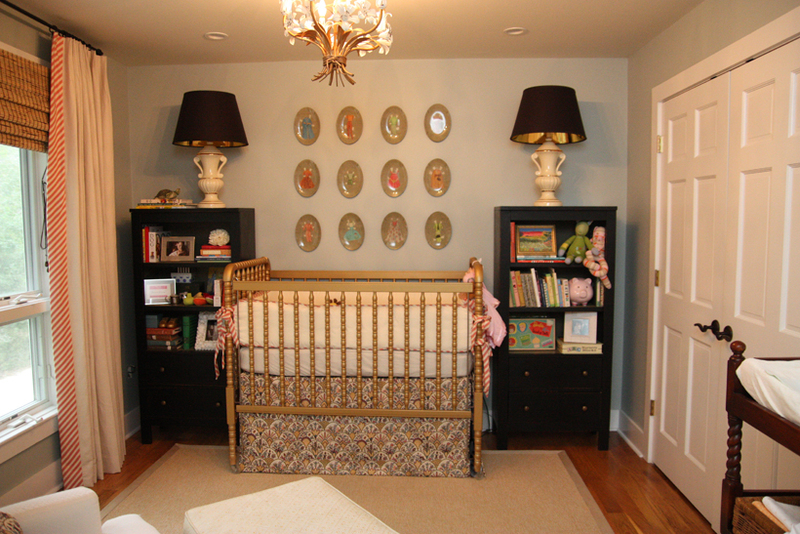 Isn’t this the nursery you just dream of having? The drapes and valance with apple green trim are what really do it for me. That, and the fabulous David Hicks daybed. Lucky baby! Can I move in? 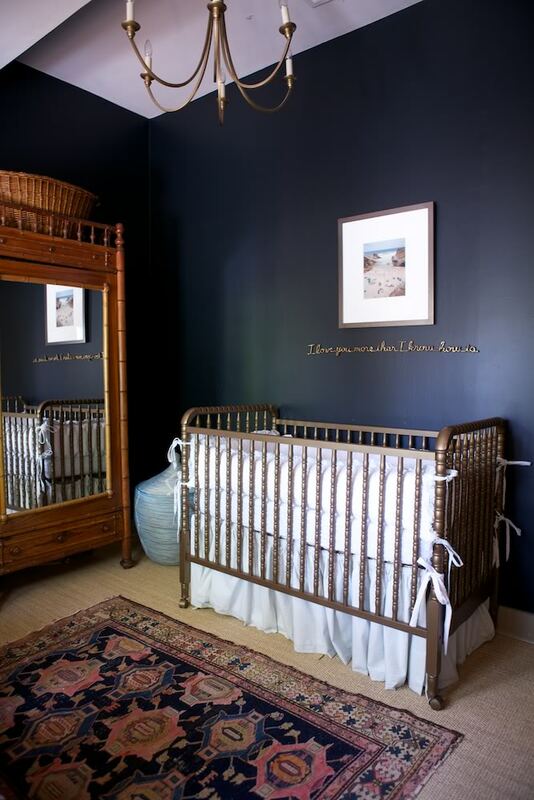 Megan’s son’s nursery is timeless with the classic faux bamboo armoire, the deep ink walls and the fabulous weathered antique rug, which all ties beautifully with his crisp white bedding. How do you like my top five all time favorite nurseries? It was hard to narrow it down. Are there any that you would add? Which one would you pick? I don’t know if I could pick 5, but I can assure you that 2 of my faves are definitely Meg Lonergan’s and Erika Powell’s–and both feature painted Jenny Lind cribs. I guess I know what I like! Oh, Kate, each one is unique and luscious in it’s own way. . . and have they EVER stood the test of time: Classic! I love the saying on the last one and I love the huge windows in most of them; mostly I can feel, just FEEL the love in all of them and that transcends even design. I love the use of the Christian Chaise “Praia Piquina” photo in that last (navy) room. Beautiful!